Perched high in the mountains of Uttarakhand, India sits The Kumaon, a rustic yet elegant hotel with breathtaking Himalayan views. 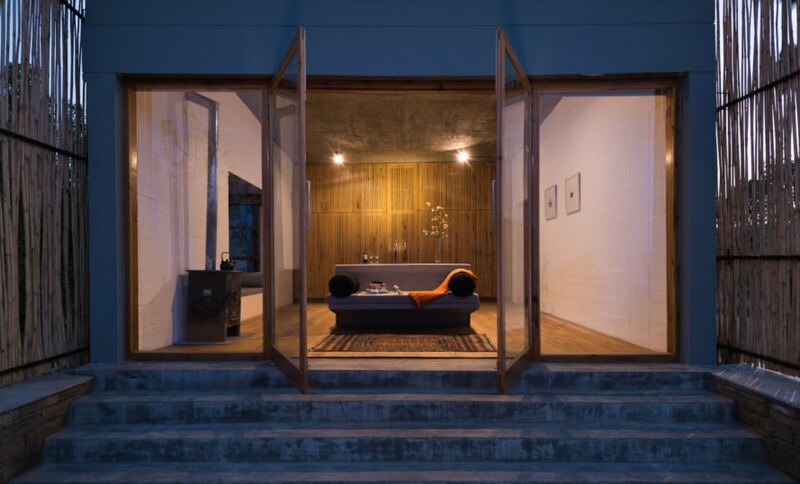 Zowa Architects designed the hotel to highlight the natural landscape as much as possible while sticking to a minimal footprint and locally sourced materials. All hotel structures were designed to harvest rainwater that’s stored in a large holding tank at the bottom of the site, while interstitial spaces between buildings are planted with seasonal crops to be used in the kitchen. The main building consists of two floors: the ground floor houses the managers’ quarters and offices in addition to a spacious lounge and library. 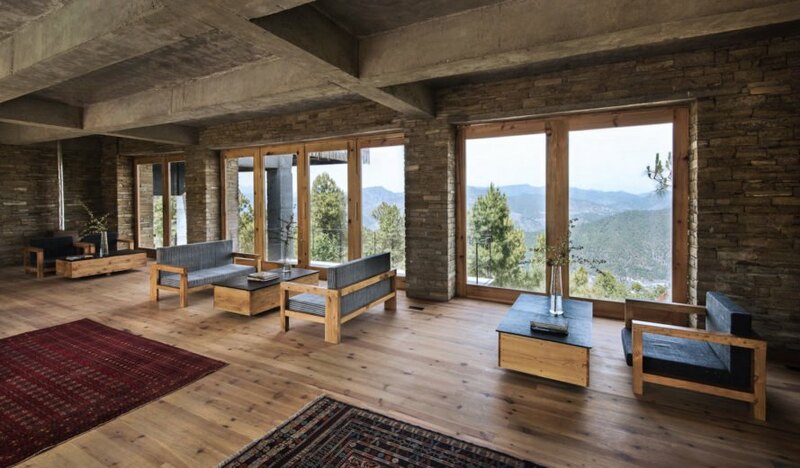 The floor above is dramatically cantilevered to the north to allow for spectacular views of the Indian Himalayas, which are best enjoyed in the second-floor dining room. The roof of the ground floor doubles as a terrace for outdoor dining and yoga. 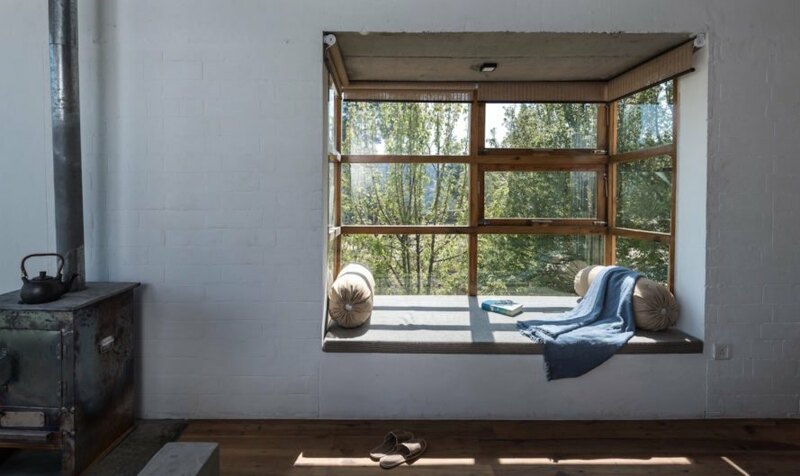 To pay homage to the local culture, the architects enlisted the help of local craftsmen and used local materials wherever possible, such as local pinewood that’s found in the flooring, doors and windows. Furnishings were also designed and made on site. The structures, built of concrete, are clad in bamboo stringed together with copper wiring to soften the architecture. The handcrafted furnishings, natural materials palette, and emphasis on natural light give the hotel a rustic back-to-nature vibe. Perched high on the mountains of Uttarakhand, India sits The Kumaon, a rustic yet elegant hotel with breathtaking Himalayan views. Boasting floor-to-ceiling mountain views, the hotel designed by Zowa Architects seeks to highlight the natural landscape as much as possible with its minimized footprint and use of locally sourced materials. 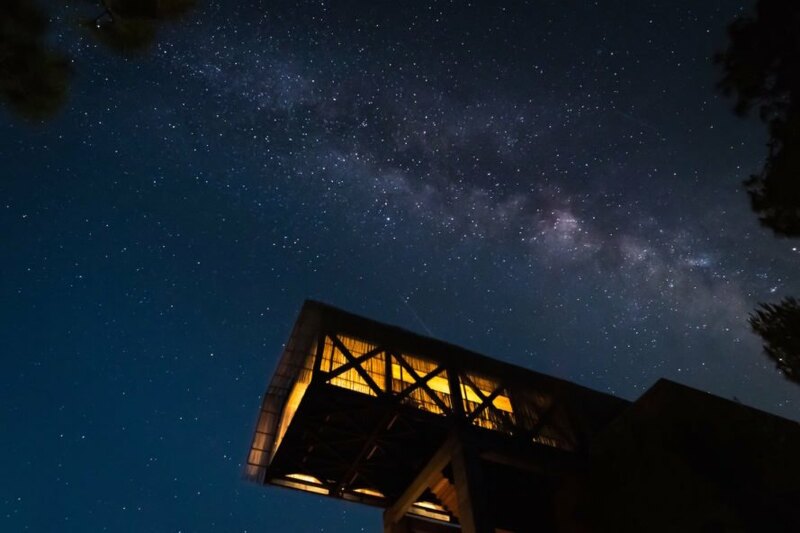 All hotel structures were designed to harvest rainwater that’s stored in a large holding tank at the bottom of the site, while interstitial spaces between buildings are planted with seasonal crops to be used in the kitchen. The main building consists of two floors: the ground floor houses the managers’ quarters and offices in addition to a spacious lounge and library. 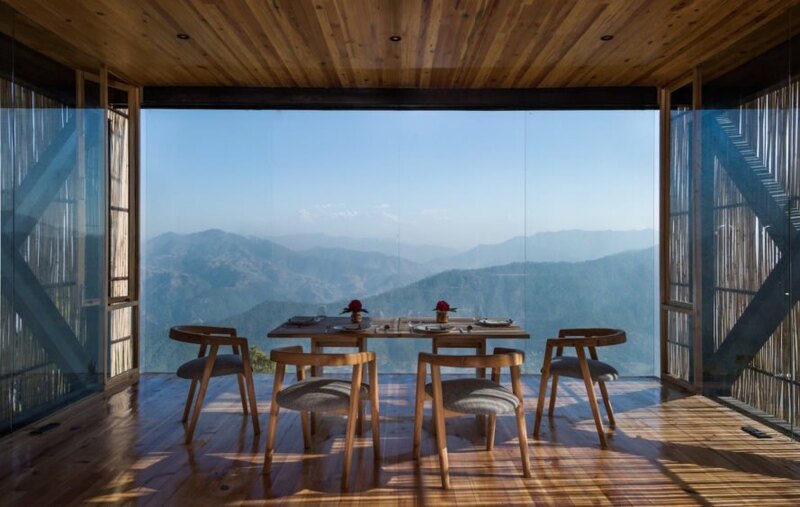 The floor above is dramatically cantilevered to the north to allow for spectacular views of the Indian Himalayas, which are best enjoyed in the second-floor dining room. The roof of the ground floor doubles as a terrace for outdoor dining and yoga. 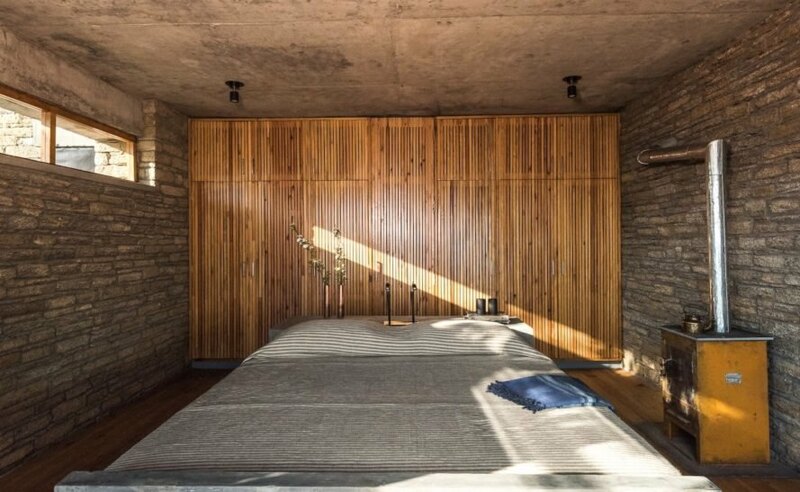 To pay homage to the local culture, the architects enlisted the help of local craftsmen and used local materials wherever possible, such as local pinewood that’s found in the flooring, doors and windows. Furnishings were also designed and made on site. The structures, built of concrete, are clad in bamboo stringed together with copper wiring to soften the architecture. The handcrafted furnishings, natural materials palette, and emphasis on natural light give the hotel a rustic back-to-nature vibe.